All transactions are safe and secure with a reliable history in online purchasing behind each of our associates. Buy the Fear and Loathing Costume t-shirt to own Fear and Loathing clothing and merchandise. 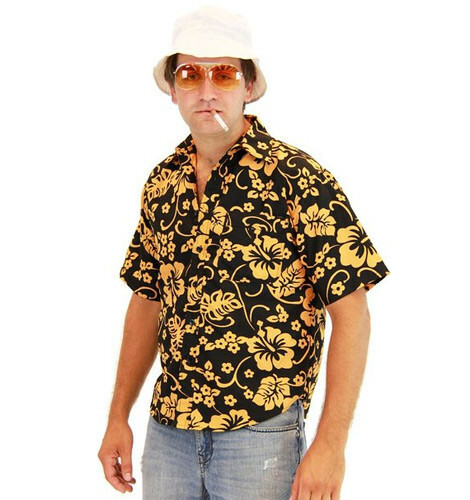 Instead of a tee, wear this Fear and Loathing costume that is nearly identical to the outfit Johnny Depp wears in the movie. The Raoul Duke costume includes the button down shirt, hat, sunglasses and cigarette holder. Disguise yourself as you repeat the Johnny Depp movie quote, "The decision to flee came suddenly." Pair the costume with a Fear and Loathing in Las Vegas t-shirt for the perfect combo gift, or buy it alone to wear on Halloween. In addition to the Fear and Loathing Costume tee above, browse the Fear and Loathing Clothing Gallery for more apparel like men's and women's clothes, kids shirts or hoodies.